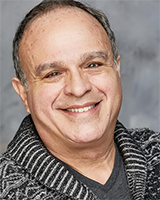 Glenn Rosenblum has been seen regionally on stage in musicals including Cabaret (Emcee), Guys and Dolls (Nathan Detroit), Man of La Mancha (Barber) and Little Shop of Horrors (Seymour). He also played himself in Annabelle Gurwitch’s hit comedy Fired!, recorded for National Public Radio at Los Angeles Theatre Works. His off-Broadway credits include Lucky Lucy and the Fortune Man starring Blythe Danner, Little Mighty with Sam Harris, and Rise of David Levinsky. Television work includes an Old Navy commercial with Kristin Chenoweth, Bones and Miami Vice. He was a participant in Master Classes at the Sundance Institute and Johnny Mercer Foundation’s Power of American Popular Song with teachers Margaret Whiting, Melissa Manchester, Billy Stritch, Charles Strouse and Jimmy Webb. Recently he has been traveling the world as a guest lecturer about Broadway Musicals on Crystal Cruises. Glenn holds a Bachelor Arts degree in theatre from UCLA, and has attended USC and Hofstra University.